Hardwood floors, natural lighting, and spacious design makes our studio perfect for meetings, parties, birthdays...and more! Make your event a memorable one with our various themed classes as an additional service. 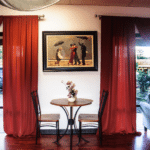 LaVida Studio is an elegant, contemporary space conveniently located in Kirkland right off i-405. 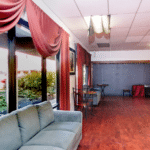 Our unique facility features warm inviting seating areas, three professional grade dance floors, waiting area, lobby and changing rooms totaling over 5000 square feet, and a state of the art sound system. Our studio is wonderful for any type of reception, corporate event, birthday, anniversary, engagement or holiday party. The main event space in STUDIO A has a 820 square foot dance floor with the seating overlooking the dance floor, and floor-to-ceiling windows with roll-out shades. The seating includes removable cocktail tables and chairs and 2 couches. The entire facility is equipped with professional hardwood sprung floor, professional sound system and full height mirrors. The space has kitchenette table console that is fixed, but you are otherwise welcome to move around available furnishings. And of course you are welcome to bring in your own tables, chairs, or other furnishings. 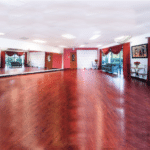 STUDIO B is an 800 square foot event space that has a wall-to-wall hardwood sprung floor and two walls ballet barres. Just like the Studio A, Studio B has floor-to-ceiling mirrors, professional sound systems, floor-to-ceiling windows with roll-out shades. 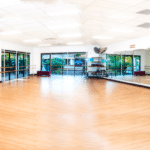 STUDIO C is a 650 square foot space that has wall-to-wall hardwood sprung floor, three walls ballet barres and stereo speaker. STUDIO D is a 200 square foot room has floor-to-ceiling mirrors and a stereo speaker. ENTIRE STUDIO has separate changing room, 2 coat storage, 2 wheel-chair accessible lobbies, 2 wheel-chair accessible ladies and 1 gentlemen restrooms. LaVida Studio is conveniently located within blocks of newly built Totem Village mall, grocery stores, restaurants, gas stations and other amenities. The space has two professional sound systems. 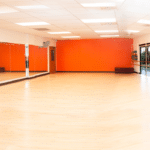 The sound systems for the main dance floor in Studio A and Studio B spaces can be used independently. LaVida staff will be onsite for the length of your rental if you require assistance with any of the equipment. Note that there is not a full kitchen on site. • Complementary filtered cold and hot water dispenser. There is free adjacent parking lot and free plentiful parking around the building at the plaza. The Standard pricing of $300/hr is for the entire studio rent. Attention: Your booking is not complete until a $300 damage deposit is submitted to LaVida Studio, and an Event Agreement is signed. Damages made to LaVida's equipment. LaVida's Supervisor on duty $25/hr (10am to 10pm) and $50/hr (10pm to 6am). We require our supervisor on duty for some events.